CONSULT A DOCTOR IF LAUGHTER LASTS MORE THAN 4 HOURS! 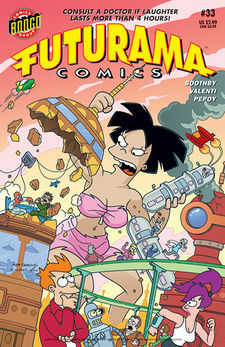 "Attack if the 50-ft Amy" is the thirty-third comic issue, which was released 26 September, 2007 in the US. Zoidberg informs the crew that the Professor is now a vegetable. He is mistaken, however, what he actually saw was Cubert and Dwight's science fair project; a genetically modified carrot with some of the Professor's DNA. The Professor uses his award predictor to determine that the boys will only come second, so they discard the carrot in the dumpster behind Planet Express (it soon begins chasing an anthropomorphic rabbit). Meanwhile, Fry announces his intention to watch a movie he rented that is now overdue. The Robot Mafia appears to "persuade" Fry to return his movies on time, which is enough to convince him to turn to Bender's movie pirating service. Cubert and Dwight search for something they can use in the Professor's lab and find "Pym Particles" and "Bigamist" which decrease then restore Dwight's size. They take the Bigamist can to use on some turnips. Amy soon mistakes the can for hairspray, and uses it before heading out for an anniversary date with Kif. While he thinks she's a little taller looking, there are no ill effects yet. Later, Fry watches a movie with Bender at their apartment. Fry heads to bed and Bender passes out, but wakes up to the police in the movie coming after the Pythagorean Pirates. Confusing the movie for reality, Bender swallows the disc of every movie ever made to hide the evidence. Believing there to be no consequences, he heads out to wish the people of New New York a merry Christmas. Amy and Kif are at a movie theatre watching the same movie Fry and Bender had been and an insult from a fellow movie goer leads to Amy, now almost as tall and grammatically incorrect as an Amazonian, throwing them out. Bender appears at Fry's window claiming to be Peter Pan, and that he can fly, failing he falls into a dumpster. When Fry goes downstairs to check on him, he is already in a car and sporting a moustache. With Fry in the passenger seat they crash into a gas station. They survive the explosion and Bender begins singing in the oil. At Elzar's Amy has grown far taller and needs to rip off the roof to go inside, she then orders the entire menu to Kif's dismay. Fry is also having trouble, Bender is still switching personalities and begins chasing Fry with a chainsaw. Amy drags Kif away to see the sunset from the top of a building before Elzar can print the entire bill. Soon Bender begins shooting at Amy from a biplane and she falls, but survives due to her skirt catching on a pole. She defeats the New New York Giants and then begins destroying the city. Bender then confuses himself for The Thing and, using Kif as a slingshot, like in The Fantastic Four, shoots himself at Amy. She returns to normal. Bender starts fighting a nearby film crew, then finally returns to normal when Fry yells "Rocky! Yer a bum!" at him. At the science fair, Cubert and Dwight show a clip of Amy destroying the city and win the fair for showing the dangers of teaching science. Bender meanwhile learns never to pirate movies again, and decides to only download comics from now on. This comic takes place exactly one year after Kif and Amy' first date. This comic is reminiscent of when Bender and Zoidberg had a fight. A defrostee once mentioned that giant carrots had ruled the Earth. It would be too presumptuous to assume that this carrot/Professor hybrid is in any way related. Elzar calls his never-before-mentioned children on the phone. To fit in with continuity, this story should take place in early 3005, and would be the last comic story (apart from Futurama Returns) to fit in this year. This was the last comic to be released before the films. Farnsworth: Oh, Cubert, I'm the least ashamed I've ever been of you! Bender: Remember, if you don't see the person you're stealing from, that makes it okay. The comic seen at the end, Roswell, is a Bongo comic. "Pym Particles" refers to Henry Pym/"Ant Man" a super hero capable of size-shifting. When Dwight shrinks to microscopic size, he ends up in a dinner with Ant Man, Atom, Shrinking Violet and Bug. The theatre is playing Pirates of the Pythagorean and The Good, the Bad and the Neutral is coming soon. They are spoofs of Pirates of the Caribbean and The Good, the Bad and the Ugly. There is a Glagnar's Human Rinds factory in New New York, although Bender refers to "Ragnar's". Apparently DVDs are either back in use, or the acronym was reused for a similar technology. Despite the Professor's claims that he couldn't afford "extremely tiny atoms" in "Parasites Lost", we've now seen two shrinking devices and one enlarging device in the comics. Amy's top and skirt merge into a dress when she climbs through Elzar's roof. The Donbot's head is drawn incorrectly. This page was last edited on 10 September 2014, at 17:32.